This stunning Western exposure newly-furnished villa offers four bedrooms - two kings, a queen, and two twins, plus a den, and three bathrooms - on a Gulf access canal with an electric heated pool, soothing waterfall, and spa on an expansive paver-covered lanai. Enjoy dining at the large teak outdoor dining table and gorgeous sunsets on the lanai which features a grill, abundant comfortable lounging areas, and a 50-inch HD flat screen smart TV. Fish for dinner from the 7,000 lb available boat lift with composite deck and a fish-cleaning station. Soaring cathedral ceilings with an open floor plan, all new high-end furnishings, and an HD flat screen smart TV in every bedroom, this professionally-decorated home makes entertaining easy with its open, well-equipped kitchen with granite countertops and bar, upgraded tile throughout, and a split floor plan with a second master en suite which provides a convenient pool bath and a slider to the lanai. The main master has a slider to the lanai and en suite bathroom with a two-person jetted tub, double sinks, and a large walk-in shower. Double doors lead to the den with desk, providing a tranquil work space or reading room. With its convenient central location, this home is just minutes from all that Cape Coral has to offer, including Cape Harbour, Tarpon Point, and the Yacht Club with its community park, pool, and beach. Sanibel Island, Fort Myers Beach, the artists' community Matlacha Island, and the Pine Island shopping area are all within an easy drive, or enjoy a bike ride on one of the two provided comfort bikes. Surrounded by lush landscaping and palm trees, the beautiful Haven by the Sea is the ultimate vacation home. Diese tolle Ferienvilla mit West Lage und neuer Einrichtung bietet 4 Schlafzimmer mit 2 King Size Betten, 1 Queen Size Bett und 2 Twin Size Betten, sowie 3 Baeder. Das Haus liegt an einem Gulf Access Kanal und hat einen elektrisch beheizten Swimming Pool, beruhigenden Wasserfall und Whirlpool. Das Abendessen kann mit Sonnenuntergang im Hintergrund auf der grossen ueberdachten Terrasse und dem Teak Holz Tisch genossen werden. Auf der Terrasse stehen Ihnen ein Gas Grill, bequeme Liegestuehle sowie ein 50 Zoll TV bereit. Sofern Sie gerne fischen, kann dies von dem Haus eigenen Bootsanleger mit 7,000lbs. Boat Lift getan werden. Die hohen Decken und der “open Floor Plan” mit hochwertiger Moeblierung sowie HD Smart TV’s in jedem Schlafzimmer werden Sie begeistern. Die Kueche ist mit Granit Arbeitsflaeche ausgestattet, Fliesen im ganzen Haus fuer einfacheres reinigen. Das Haus bietet 2 Elternschlafzimmer mit direktem Zugang zum Swimming Pool und der Terrasse. Das Haus ist sehr zentral gelegen, wenige Minuten von Cape Harbour, Tarpon Point und dem Yacht Club mit Community Park, Pool & Strand. Sanibel Island, Fort Myers Beach sowie das Kuenstler Viertel Matlacha Island sind einfach und in kurzer Zeit mit dem Auto zu erreichen. 2 Fahrraeder stehen fuer Sie zur Verfuegung. Have used Vesteva for many years and have never had any complaint. Any time we were not completely satisfied with some aspect of the rental property they responding quickly and resolved any issues. The information provided prior to booking is always clear as is any information provided after booking. The property was very nice. Pool area is really inviting and exceptional quiet in the evening. Love the Cape Coral area as it seems really safe and lots of restaurants, entertainment close by. Pine Island is worth visiting - Matlacha and Saint James City are great. Family business and it shows, very detail oriented very responsive. This home is downright beautiful! From the decor to the canal - truly is paradise! One thing we really loved was being able to go right out back and fish or hop on a bike and go for a ride (if cool enough). Thanks to y'all our Mother's Day was a great success! This is the absolute perfect time to come here! The Cape is a wonderful place and we will be back soon! Thank you for sharing your home with us! We will never forget this memorable trip and this beautiful house! Paula, Justin, and Alison - from Chicago. Our family of 7 had a wonderful time in your beautiful home! The kids couldnt get enough of the pool and it was so relaxing on the lanai. We had a great time exploring Cape Coral and Sanibel, but I think the best days were soaking up the sun right here! Fellowship Park down the road is a must for anyone with small children like us! Couldnt ask for better weather back to 35 degrees in New York tomorrow. We hope to make it back this way again. Your gorgeous home has helped us make wonderful memories on our vacation. Jerry, Tammie, Allie, Kyla, Samantha, Josh, and Mattie. Easy process, this is a family business and it shows. The team is very involved and personal. Great service. Out of the three houses we have rented this was our favorite and we would definitely look to stay here again. Beautiful home with everything you need. 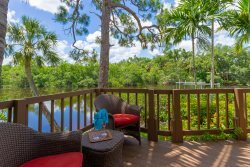 Una maravillosa casa para disfrutar del rea de playas de Sanibel y de la zona de Cape Coral / Fort Myers. Muy recomendable. This property is excellent! The property owners keep the property in great shape, clean and with all the amenities that you need to enjoy a great time at the property. The back area with the enclosure pool was our favorite spot every day for enjoying a great time at the pool or the hot tub, eat our meals or just to relax at any time of the day. The property owners check on us as promised the day after we arrived and the day we left, and they provided very clear information answering all questions we had. Thank you for being a great host and for allowing us to enjoy a great vacation week at your property. We were very satisfied, and will contact you again next time we choose Cape Coral for a vacation destination. Vanessa and Stefan were both great! Thank you! Nice house and lived the western exposure! Vanessa and Steffen were so very friendly like family and were generous in taking care of our needs. It is such a relief not to worry about renting, they help us in every way. Thank you guys so much you make our stay so much more pleasant! Loved the barbeque and meeting the family!